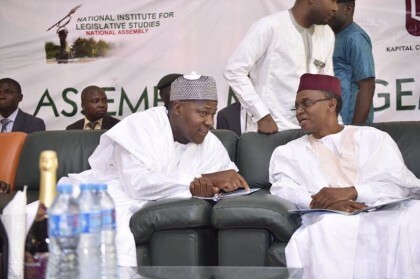 Samuel Aruwan, Kaduna: The Kaduna State Government wishes to issue this update in relation to the gentle admonition that Mallam Nasir El-Rufai gave to the NASS leadership on the imperative of budget transparency. The House of Representatives has responded with predictable tetchiness to a simple and clear demand that details of the National Assembly budget be made public. It is inconceivable that an important institution, vested by the Constitution with representation, lawmaking and oversight powers, has for at least seven years ignored the imperative to set an example of transparency, despite being severally urged to do so. Despite the rush to personal attacks on a matter of public policy, we cannot allow the enthronement of the republic of distraction. It is important that everyone who is interested in protecting and advancing democratic discourse should stay focused on the issue. It is strange that persons entrusted with high office will justify their abdication of the responsibility to be transparent in such cavalier fashion. We don’t believe that most of our esteemed legislators will construe a demand for transparency as aimed at undermining the National Assembly. However, notwithstanding the intemperate response of the spokesman of the House of Representatives, the demand that the NASS budget be made public will not go away. It is not personal, and there is a strong civic constituency that is demanding it. The sooner all of us in public life recognized that the game has changed, and that segments of civil societyand indeed everyday citizens of Nigeria, are much more aware, astute and advanced than the state of our politics, the better for our democratic health. Since the NASS began conceiving its budget as a single-line item, how many legislators, not to mention other citizens, have seen the details of the budget? Can anyone recall seeing the spending patterns and details in any published audited accounts of NASS recently? By contrast, all state governments present their audited accounts to their state Houses of Assembly as required by law. The federal statutoryagencies that NASS cites as not having their budgets reflected in the National Budget submit details of their budgets to the NASS for review and approval. How, in the 21st Century, can we have any nationalinstitution that is comfortable with not being subject to any oversight, audit or external scrutiny. The constitutional principle of checks and balances wasnot introduced for purposes of idle luxury, but to ensure that every institution exercises its power in an accountable manner. The Kaduna State Government has presented details of its security budget. What was presented represents the only security vote for the entire government. As the figures show, there is no security vote for the Governor of Kaduna State. This may be a shock to those used to the notion of security votes as barely disguised slush funds, but we do not operate such a system in Kaduna. Our budgets specify what is voted as assistance to security agencies, and its expenditure is properly recorded and accounted for. These are not monies given to or spent by the governor. If the leaders of the NASS have security votes allocated to or personally collected by them, they might wish to disclose such. Our security spending does not operate like the NASS system of sharing public funds in such an opaque fashion that even NASS members do not know how their entire budget is broken down or what the leadership gets as its ‘running costs’. The figures in the pay slips presentedfor the Honorable Speaker are in stark contrast to the declaration by The Economist regarding the earnings of NASS members. One of the claims cannot be right. We reiterate our call for the NASS to download and analyze our budgets and actual spending which are all publicly available. In Kaduna State, the state government has been a net creditor to the local government councils, some of which cannot pay salaries without assistance by the state government. We do not retain local government funds nor impose contracts on them. Our policy announcements in this regarded were widely reported and appreciated. The spokesman of the House of Representatives may wish to respond to what is written, rather than what is imagined. The KDSG statement of Monday, 10thApril 2017, clearly stated that N100bn is bigger than the capital budgets of many states. That is a statement of fact. In dragging the memo Malam Nasir El-Rufaisubmitted to President Buhari seven months ago into this matter, the spokesman of the House of Representatives betrays no recognition that it is the conduct of those that leaked private communication that bears condemnation. When NASS hopefully eventually releases its budget details, the public will be hoping to see specifics on personnel costs, overheads and capital expenditure.Rather than restrict the budget details to only 2017, the current leadership of NASS should fulfill the obligations of transparency by releasing the breakdown of the NASS budget since 2015. That way, Nigerians, including members of the NASS, will get to know what the budget of that institution is. The NASS leadership has been promising ad infinitum to publish the breakdown of the opaque, one-line budget. It should simply do so. Prompt release of the 2015 and 2016 breakdowns, along with the proposed figures for 2017, would be a good way to start. As things stand today, even if Malam Nasir El-Rufai refrains from further commentary on this matter, the genie is already out of the bottle. The public will not accept a secretive NASS, or any other branch of government for that matter.